Maggie Elehwany of the National Rural Health Association at a rally in Washington, D.C.
Hill observers are mixed on how close lawmakers are to a deal to restart Medicare extenders, which are provisions of Medicare that have to be renewed by Congress regularly. Some are doubtful Congress can hammer out a compromise before the end of the year as the Senate tries to pass its version of the GOP tax bill and leadership negotiates a budget patch to buy time for its end-of-year spending bill. The current continuing budget resolution expires Dec. 8. "Medicare extenders and (the Children's Health Insurance Program) will probably happen, but we'll be down to the wire," says Julius Hobson of Polsinelli. Hobson says he's not completely sure all the extenders will make it into an end-of-year package as the Senate will have to work out difficult political issues following the tax bill. "It's how they can negotiate to work something out—that's what I'm not sure of," Hobson says. One patient advocate is more optimistic, as he expects leadership will advance a second short-term continuing resolution just before Christmas that will include at least some extenders and CHIP authorization as well as an increase of caps for domestic, discretionary and defense spending. This continuing resolution would run at least two to three months, the advocate said. Rodney Whitlock, vice president of ML Strategies, is also optimistic given that three committees have announced deals on the extenders in various iterations. Like Hobson and other lobbyists, Whitlock doesn't see anything happening before the end-of-year spending bill, but he says the fact that both chambers have bipartisan deals, rather than having just all-Republican and all-Democrat bills, means a final deal isn't as far off as it could be. "It will absolutely happen this year," Whitlock says. "They can't not get it done." In the meantime, hospitals have faced uncertainty since the start of the new fiscal year in October. "It's little irresponsible of Congress to let the extenders expire," said Maggie Elehwany of the National Rural Health Association. "We're in the middle of a rural hospital closure crisis that is escalating. These payments are so critically important." On Nov. 15, the House Ways and Means Committee released details of a bill that include two- to five-year extensions of the extenders programs. But they include offsets that rural hospitals aren't happy with. The Medicare Dependent Hospital Program and Low-Volume Adjustment Program, two provisions that Elehwany highlights as critical for rural hospitals, get just a two-year extension. They expired at the end of the fiscal year on Sept. 30, along with two other provisions: the delay on the 25% patient threshold for long-term care hospitals and the long-term care hospital moratorium. But the House will have to bridge differences with the Senate Finance Committee, which released its own discussion draft in late October. The House hasn't finished its internal debate either, as the Energy and Commerce Committee also has primary or shared jurisdiction over some extenders. An Energy and Commerce GOP aide said discussions are ongoing on a deal both House committees and the two chambers can agree on. Elehwany and other lobbyists say pay-fors are another issue. The offsets for the Ways and Means deal negotiated by Chair Kevin Brady (R-Texas) and Ranking Democrat Richard Neal of Massachusetts include cuts in reimbursement for critical-access hospital Medicare swing beds. Elehwany calls this particular pay-for "tone deaf." 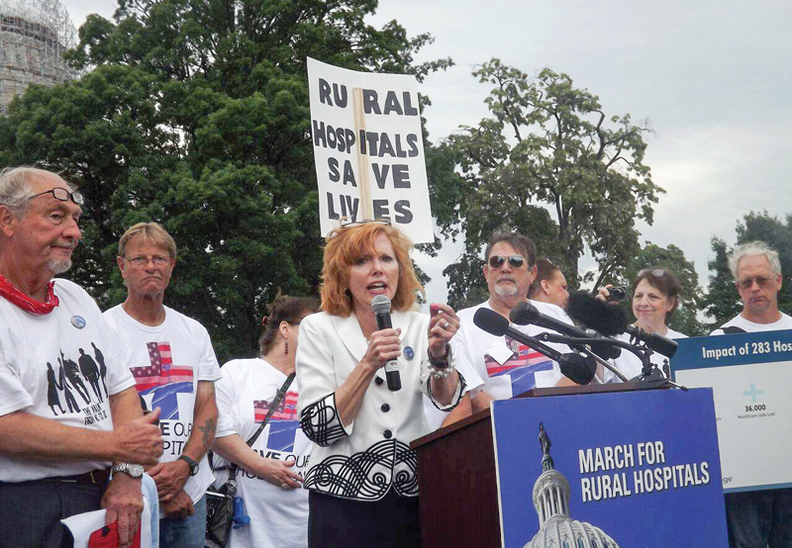 "They don't understand just how much rural hospitals are struggling," she said. "You'll close hospitals if you do that." Elehwany notes the delay is escalating the budget crises for rural hospitals. The wait has meant additional uncertainty to hospitals, which are used to it due to the temporary nature of the extenders. The other, pressing issue is the onslaught of closures, she said. The latest announced shuttering came this week. Alabama's Lakeland Community Hospital said it will close at the end of this year. According to Alabama.com, Lakeland is the state's seventh hospital to close in the past eight years. The National Rural Health Association, which tracks the closures, says it marks the 83rd rural hospital closure since 2010. Elehwany says 65% of these closures have happened in states that didn't expand Medicaid, since the Affordable Care Act was supposed to make up for the cuts through its coverage expansions and the accompanying reimbursements. Both agreements released by House and Senate committees are mum on the cut-off of disproportionate-share hospital payments mandated by the ACA, which has been delayed by Congress until this year. These technically went into effect Oct. 1. The DSH cuts are $2 billion in 2017 and will total $43 billion through 2025, according to the Association of American Medical Colleges. So far the payments, which are made monthly, have continued even though the moratorium has expired, a House aide says. Hospitals continue pushing for a minimum two-year delay of the cuts, according to AAMC. The Medicare extenders debate is coupled with the reauthorization of the Children's Health Insurance Program. So far, the CMS has been making payments to states and U.S. territories that have run out of funds. According to the latest CMS figures, the agency has paid out nearly $607 million in October and November, with an additional $3.9 million scheduled to go out to Washington, D.C., for November. Nevada on Tuesday put in a request for $11.3 million. This makes it the 10th state, plus Washington, D.C., and three U.S. territories, to ask for CHIP stopgap funds. Elehwany points out that the CHIP delay disproportionately hits rural America, where 80% of the women who give birth are insured through Medicaid. Beyond the funding for these programs, hospitals are also wary of the threat of sequestration, which passage of the GOP tax bill could trigger. The sequester would hit Medicare with a 4% cut annually.